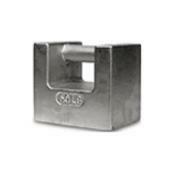 We basically offer cast iron weights and three (3) different designs of stainless steel weights. Due to varying configurations, the actual appearance of your product may be slightly different than shown on the catalog and website pages. Serial numbers are available for an additional charge when ordered without laboratory documentation certificates. Individual leaf weights should be ordered with protective vial (individual leaf weights are for custom-designed kits). CAST IRON WEIGHTS are painted weights with adjusting cavity for sealing. Weight capacities of 10kg/20lb and up meet NIST Handbook 105-1 & Handbook 44 specifications. Applications where cast iron weights are used include field standards for testing industrial devices. The classes are as follows: NIST Class F, ASTM Class 6 & 7 OIML Class M1 & M2. STAINLESS STEEL WEIGHTS are available as Electronic Balance, Grip-Handle, Precision (screw-knob design) or OIML Precision (One-piece design). ELECTRONIC BALANCE WEIGHTS are Type II design feature a sealing cavity for adjusting material in 100g or larger weights. The density is approximately 7.84g/cm3. Finish for Class 1 and OIML F1, F2 are polished. ASTM Class 2-4 are satin. 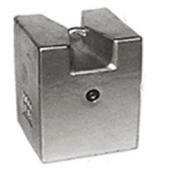 NIST Class F weights are manufactured to the specifications of NIST HB-105-1. ASTM Class 0-7 are manufactured in accordance with ASTM E 617-97 specification and tolerances. Applications are as follows: calibrating Class I & II balances or ASTM Class 4, 5 and 6 weights. PRECISION WEIGHTS (screw-knob design) are Type II design with sealing cavity for adjusting material. The density is approximately 7.95g/cm3. ASTM classes 1-4 have a polished finish. Applications include: calibrating Class I & II balances and ASTM Class 4, 5 and 6 weights, student laboratory use, and rough weighing operations: i.e., force. PRECISION LABORATORY weights are a Type 1, one-piece construction with no added adjusting material. The density is approximately 7.95g/cm3. ASTM Class 0 and OIML E2, F1, F2 have a polished finish. OIML M1 and M2 have a satin finish. ASTM Class 0 weight sets and individual weights are not individually marked with their weight value and cannot be individually serialized per ASTM E 617-97. ASTM Class 0, E2, F1, F2 and M1 weights include their own protective case. OIML weights are manufactured to the specifications of the International Recommendation, OIML R 111, 1994 Edition. Applications include: weights used as standards, density measurement, and OIML guidelines. ALUMINUM WEIGHTS are used for denominations of 5mg to 1mg OIML design. We offer several configurations for weight sets. Class F weights have many set configurations to assist in calibration of scales; higher accuracy sets are available in 5-2-2-1 and 5-3-2-1. Custom sets are available as build to order to meet your specific requirements. Each weight set consists of the weights, case and/or small weight case (as appropriate), and appropriate lifting design consisting of one or more lifter, tweezers, and white cotton gloves. OIML and ASTM weights sets larger than 500g or 1lb include a hardwood case with velvet-lined pockets. Weight sets with the largest weight of 500g include a precision-machined polyvinyl, crush resistant case. Serial numbers are not stamped on polished weights or milligram weights. The correct class weight for applications is dependent on the use. Weights should be more accurate than the precision of the weighing device and it is recommended that a weight has an accuracy of one-third (1/3) of the weighing device readability. All cylindrical ASTM kits (excluding grip handle weights) include their own protective case and glove set for safe handling. Our supplier offers several different calibration certificates including the Total Measure Assurance Program (TMAP) certificate. CALIBRATION CERTIFICATION for weight classes ASTM 0-3, OIML E2, Fl and F2. The calibration is performed per NIST Mass Dissemination. Meets ISO/IEC 17025 certification. For ASTM Class 1-3 & OIML F1 & F2 SOP 5, 3 in 1 weighing design and SOP 28 Advanced weighing designs. RLWS MASS VALUE CERTIFICATE is not an accredited certificate. As found, as left data with environmental conditions are reported. Uncertainty to Tolerance of 3:1 is not guaranteed for weight classes ASTM 1-3, OIML F1, and F2. SOP 8 (following Rice Lake Work Instruction WI05-0023). Additional time may be required for ASTM Class 0 weight certification. SERIAL NUMBERS are included in the cost of all certificates with the exception of the Certificate of Accuracy. Certificates are included in the box with the weights at time of shipment. One final note, much of this information above may be overwhelming to some of you but in most scenarios that we deal with, customers typically need NIST Class F cast iron grip handle test weights or NIST Class F Stainless Steel Cylinder Test Weights. Traceable certificates can be added if you need documentation for your quality control department. Call or email us for information and pricing. Cast Iron Calibration Test Weights (Large Capacity) Large Capacity Cast Iron Scale Calibration Test Weights, NIST Class F includes 100 lb Avoirdupois Grip Handle Weights, 200 lb, 250 lb Avoirdupois Heavy Capacity Grip Handle 500 lb, 1000 lb, 1500 lb, 2000 lb, 2500 lb, 3000 lb Avoirdupois Heavy Capacity Grip Handle and more. Cast Iron Calibration Test Weights (Small Capacity)Cast Iron Scale Calibration Test Weights includes ASTM Class 7 Smaller Capacity Cast Iron Test Weights: 1 lb, 2 lb, 5 lb, 10 lb and NIST Class F 20 lb, 25 lb, 30 lb, 50 lb, 100 lb. KG weights also available including: 500g, 1 kg, 2 kg, 5 kg, 10 kg, 20 kg, 25 kg, 35 kg, 35 kg, 50 kg and more.